First of all, thank you all so much for sharing the joy in our news. We are so excited to welcome a baby girl into our lives. I’m already so anxious to meet her! And I’m pretty sure she’s anxious to get out, too, because it’s like a dang karate school in my belly right now with all her (adorable) kicking. Second of all, this coffee cake. You have to make it. The end. OK but seriously, let’s think about all the things that are probably on your mind right now (as they are mine) — Christmas shopping, preparing the Christmas dinner menu, Christmas shopping, shoveling/snowblowing the snow off the driveway, decorating for Christmas, making sure you don’t slip and break a hip on your way from the house to the car, Christmas shopping, making sure the cat doesn’t destroy all the ornaments at the bottom of the tree, Christmas shopping (in case you can’t tell, I am WAY behind on my Christmas shopping). The last thing you’re thinking about is getting a legit meal on the table (unless Christmas cookies count, which in my house they totally have/do). While you might not be so keen to have coffee cake for dinner (in which case, this soup should do the trick), you can definitely cross off your weekend breakfast/brunch with this one. And you get to sleep in, too. Huzzah! If you’re not a real coffee cake fan (because it’s too sweet/too crumbly/too whatever), this recipe will likely change your mind. It’s sweet, yes, but it’s also tangy from the orange marmalade and cream cheese filling. 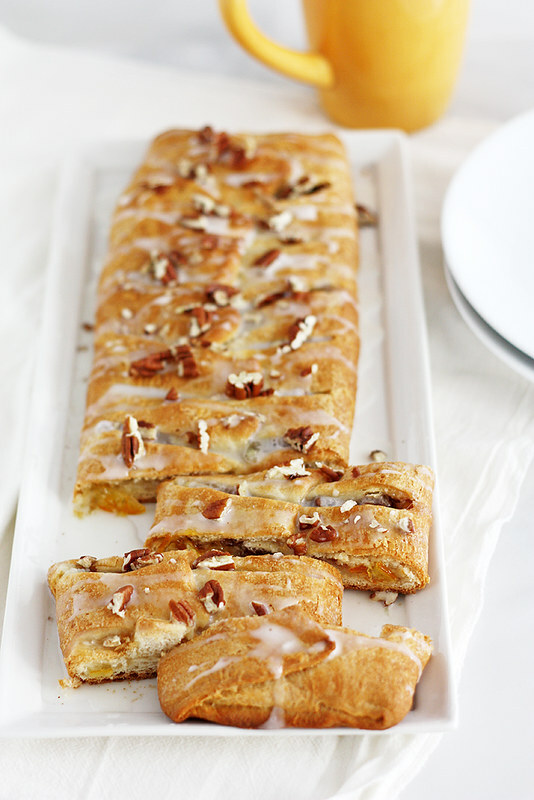 And using Pillsbury crescent dough to make a braided coffee cake? Life = changed. It’s easy, it’s convenient, it’s delicious — it’s pretty much everything I’d want in a homemade breakfast/brunch treat. Done and done. Oh, and those crunchy pecans added to the mix? Good gracious yum. In our house, this coffee cake has manifested itself as breakfast, second breakfast, afternoon snack and dessert on multiple occasions. I can see it not only making a great addition to a holiday brunch, but also a tea-time spread (if that’s a thing you do) and a dessert table. Really, there is no pretense with this cake — it’s just really good, no matter when you eat it. P.S. 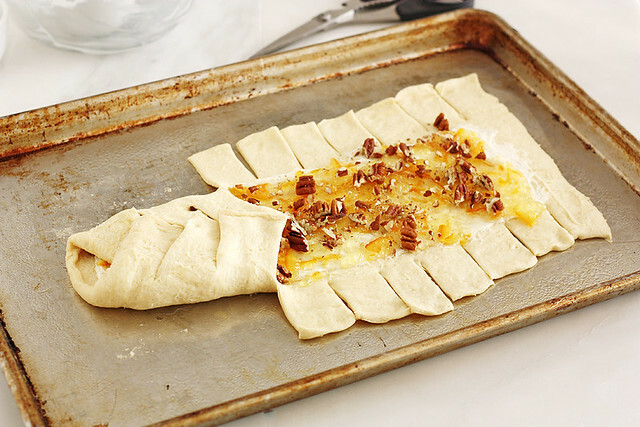 Check out more Pillsbury holiday eats on Serious Eats’ recipe hub. Preheat oven to 375°F. Lightly grease a baking sheet with cooking spray. Using an electric mixer on medium speed, beat cream cheese and sugar until light and fluffy. 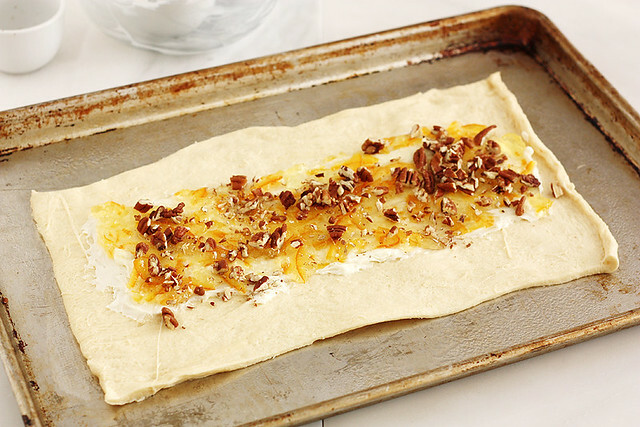 Unroll seamless dough sheet onto prepared baking sheet. Spread cream cheese mixture along the center third of the dough. Spread marmalade on top of the cream cheese mixture. Sprinkle with chopped pecans. Use kitchen scissors or a knife to cut 1 inch strips on either side of filling. 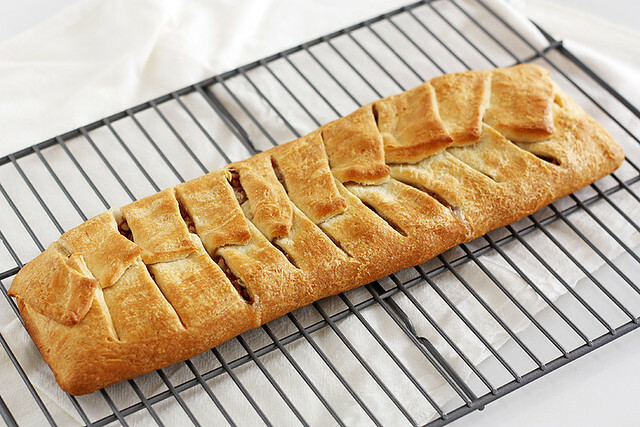 Carefully fold opposite strips of dough over filling, crossing in the center to make a “braid.” Seal ends. Bake 20 minutes until dough is golden brown. Transfer braid to a cooling rack; cool completely. In a small bowl, whisk together powdered sugar and milk to make a glaze. 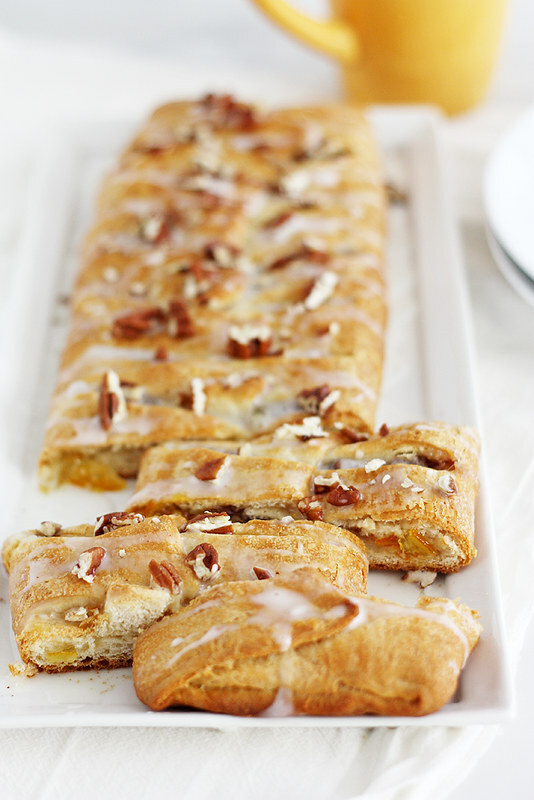 Drizzle glaze over cooled braid; sprinkle with extra chopped pecans. This could sustain me for hours on end during the Christmas period. I hate nothing more than popping out to find stuff to make for dinner; so I would glady eat dessert for dinner or anytime for that matter! Congrats on the baby girl news, My sister just had a baby girl too! LOVE THIS. It looks so tasty. I love the use of oranges too, must try this! 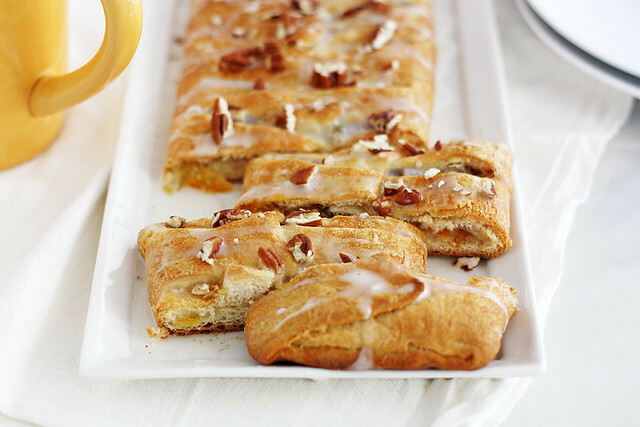 Literally just made peach pecan cheese danishes recently. It’s like the fruit + pecan movement is upon us! Many congrats on the baby! How exciting! Girls are the best! Not that I’m prejudiced or anything. AND, I probably just jinxed myself to only having boys for grandbabies. This looks awesome and I’m wishing I had a piece right now. This is so pretty! Love the orange pecan flavor! Aww girls are the best (don’t tell my son that I said that)… and well..my daughter is a teenager now so that statement changes day to day. But I love every minute of it. So happy for you.. I really wish I had a slice of this cake right about now. YUM! This is totally dreamy!! Looove it! Soooo excited for you and your baby girl!!! And this coffee cake–LOVE how easy this is, and with such a pretty result! Delicious! And congrats on the baby girl news. So excited for you guys! Congrats on the little girl…so exciting!! I just did most of my Christmas shopping today..in my pyjamas! Online shopping is quite possibly the best thing ever. And this coffee cake, yah it looks ridiculously good! Erika — Haha, I know I’m in for unique challenges — erm, adventures — no matter what. 🙂 Thanks, friend! My life totally needs this coffee cake in it – gorgeous! CONGRATS! Seriously, everyone I know is having a baby girl! I have 2 nieces and both of my besties are expecting girls. Needless to say, Christmas gifts this year are all girl-centric. Also, this coffee cake looks delish. I love the idea of the marmalade and cream cheese! Love this recipe! Just the kind of simple but super impressive thing that is the staple of all good holiday cooking. Wowza, this looks great! 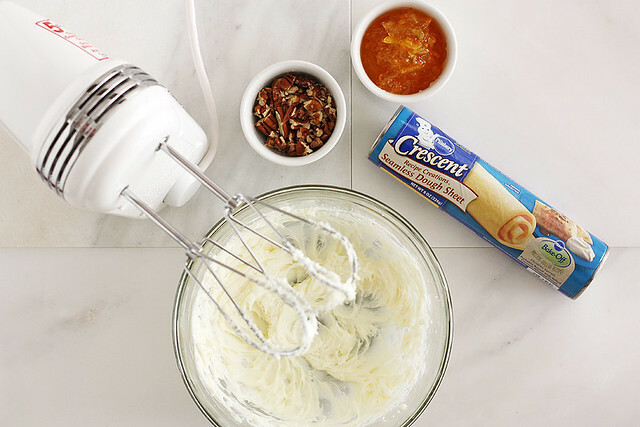 I would have never thought to combine orange and pecan, this sounds great! This coffee cake looks so pretty! I love the orange pecan flavor combination, it sounds wonderful and it comes together so easily too.